Well before shoppers had a chance to buy the all-new Jeep Wrangler, Fiat Chrysler Automobiles’ in-house Mopar parts division had already spent tens of thousands of hours developing a stout catalog of accessories for the vehicle. Mr. Gorlier, who spoke with The Blade earlier this week at the North American International Auto Show in Detroit, said a remarkable 98 percent of Wranglers on the road have at least one Mopar-branded accessory. 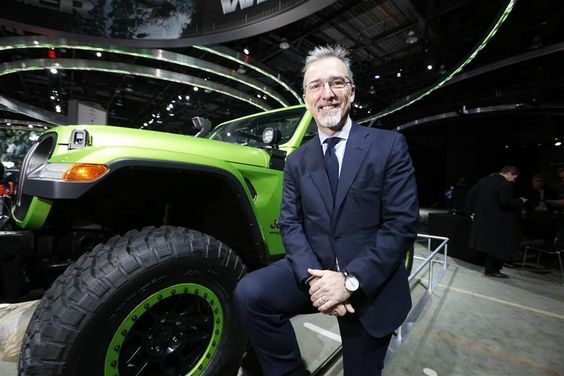 “The Wrangler is by far always one of the top vehicles in terms of customization,” Mr. Gorlier said. So important is customization to Jeep that the company elected to show the first official photographs of the new Wrangler during Mopar’s October presentation at the Specialty Equipment Market Association in Las Vegas, a month ahead of the vehicle’s debut at the Los Angeles Auto Show. The new Wrangler, which is just beginning to arrive in dealerships now, is built in Toledo at Fiat Chrysler’s Toledo Assembly Complex. While many customers buy their parts direct from Mopar or through a dealership, Fiat Chrysler does have a number of facilities near its assembly plants — including one in Toledo — that are dedicated to adding Mopar accessories before the vehicle goes to the dealership. Mr. Gorlier said that’s helpful for both buyers and dealers, as the fit and finish is guaranteed to be up to the same level as the rest of the vehicle, and because the accessories are included in the overall sales price of the car, allowing them to be financed if the buyer chooses. The company has a pair of Mopar-modified Wranglers on display at the North American International Auto Show to highlight some of those new parts. Both vehicles have a 2-inch lift kit. The two-door Wrangler gets a roof rack and a fold-out tailgate table — both of which are firsts for Mopar. The four-door Unlimited model has a winch, LED off-road lights, tube-steel doors, and a snorkel that allows for driving through deeper water without sucking water into the engine. There’s no shortage of competition in the off-road accessory space, but Mr. Gorlier said Mopar has the advantage of having developed its accessories alongside the vehicle. Mopar also tries to get direct feedback from Jeep owners at events like the annual Easter Jeep Safari in Moab, Utah. Jeep’s own engineers also attend that event, but Mr. Gorlier said Mopar is able to react to requests more quickly. “Jeep takes ideas that would be probably incorporated in the next-generation vehicle. We take ideas that may be incorporated in the next year product,” he said. Starting prices on the new Wrangler have increased in the neighborhood of $2,500 to $3,000 over comparable models from the last generation, but Mr. Gorlier doesn’t believe that will cause owners to hold back when it comes to buying accessories.